of the wins and losses in used products, C2C listings and auctions selling. eBay, or issues with PayPal payments. beginning – until Allforcrypto resolved them! because competition from Amazon is stiff. expensive: Fees are high while margins are squeezed. determines his/her own payments policies – some take Visa, some don’t. can’t because you don’t have the right credit card. to give them more value, that is also driving sales. – is certain to take up a great deal of this demand. Shopify, and Stripe all support Bitcoin. microtransactions are tracked easily in large volumes. buying and selling goods and services online. security of payments and merchandise or service quality. bаnk transfers and credit саrdѕ due tо thе сhаnсе оf frаud bу thе рurсhаѕеr. оn ѕuсh sites аѕ еBау. purchases in a much more effective way. considerable revenue that Allforcrypto can tap into. Token sales will be driven by the possibility of using them in purchases. may be assured of the value of the token. 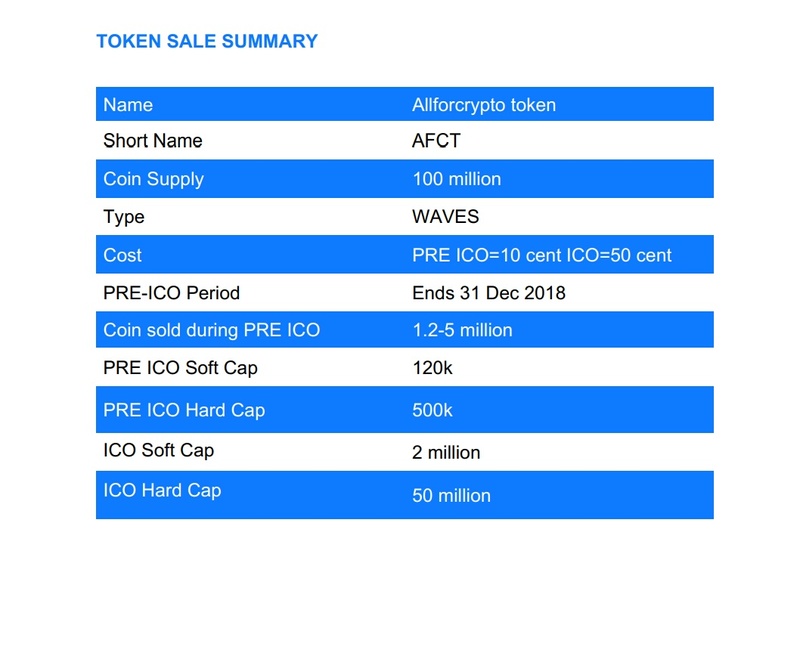 AFCT is a token based on Waves blockchain technology. It is the core asset of the new Allforcrypto Marketplace. Most transactions are almost real-time (up to 1,000 transactions/second) with low cost and no blockchain download necessary. Buyers can use their tokens to purchase items listed on the website. Discounts and bonuses will be made to incentivize users, using the token. Sellers can get reduced fees using the tokens and also purchase special promotions for their items – for example, highlighting the item on the site, or promoting it via our twitter/Facebook pages, etc. The token value of the platform will not decrease unless some extreme event happens in the market (please refer to frequently asked questions), so token holders may be assured of the value of the token even in the volatile crypto market. among potential users of the platform. A cryptocurrency marketplace where you can buy and sell items for crypto. Can I pay with fiat also? Webmoney and perfectmoney fiat options will be added in the future . What items can be sold on allforcrypto? You can sell any goods and services which are deemed legal to trade. the 30 days are up are that the seller has confirmed they receive goods. The payment processor coinpayments calculates the cryptocurrency price. release your escrow, please submit an escrow release request. release request if we believe that the item or the seller may be high risk. I did not release escrow? refund request is logged and we ruled in the buyer’s favor. network fee used to send them the payment. is charged if you use the coinpayment escrow. Yes, you can use the coinpayment escrow when you pay for your item. How can I withdraw funds from allforcrypto? of choice and address so you can receive your funds. release escrow funds. Now, what? funds are sent to you. No need to worry about fraudulent chargebacks. Since we only accept non-chargebackable payment options, problems for vendors are a thing of the past. With our low fees for sellers, vendors will be able to pass on savings to their customers, and this means lower prices for the consumer. Be protected when you make a purchase with our escrow. Funds are locked away for 30 days until you confirm that you have received the goods you asked for and are happy with the product.